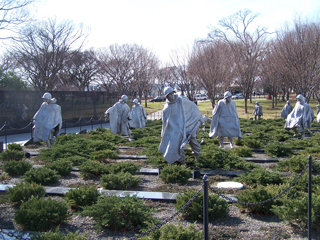 One of the Mall's newest monument is to the veterans of the Korean War. The memorial was dedicated in July 1995, 42 years after the war ended. The memorial includes a sculpture of a platoon of soldiers walking across a field and a wall with images of the casualties in the conflict. The memorial is on the Mall south and east of the Lincoln Memorial near the Reflecting Pool.